The new 1.8-liter engine had 16 valves, dual cams, and dual VVT-i (Variable Valve Timing with intelligence for both intake and exhaust); it produced 132 hp at 6,000 rpm and 128 lb-ft of torque at 4,400 rpm, similar to the prior motor, but had been redesigned for lower costs and higher gas mileage — which was 27/35 mpg (with or without automatic). 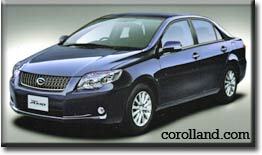 The 2009 Corolla started at $15,910; the XRS started at $20,610 (including destination charges). The Matrix ran around $900 more. The Corolla S looked particularly aggressive, and better differentiated from its brethren. From the outside, it is hard to believe this is the same Corolla; from the inside, many old-Corolla characteristics remain, despite some cost-cutting. The climate controls felt cheap, and switch blanks are used in too many places. Seats were moderately stiff but not uncomfortable, and there was plenty of space for driver and passenger, with good all-around visibility. 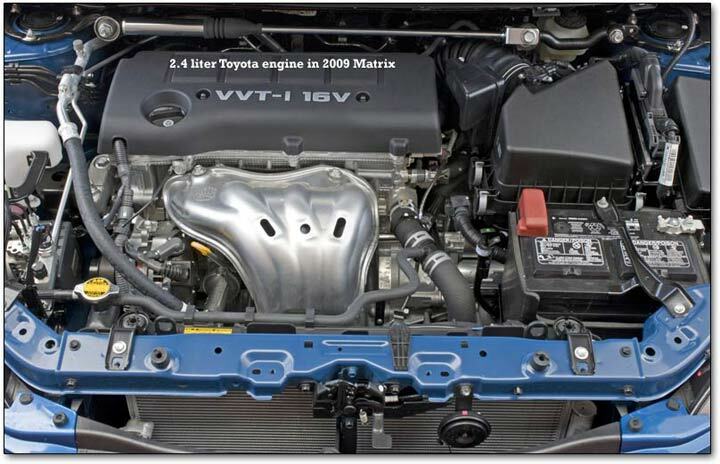 The 2.4 liter twin-cam engine, retuned for the Corolla XRS, returned gas mileage of around 22/30 mpg; it produced more “usable performance” for the average driver than the old rev-happy 1.8 liter XRS model. 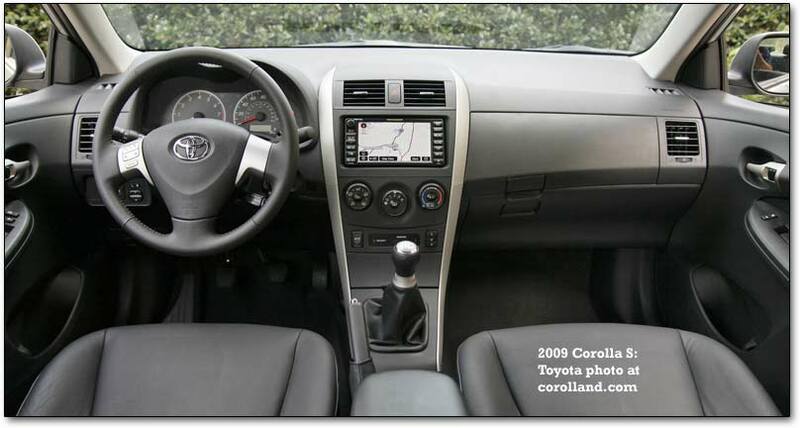 While the 2009 Corolla kept the same headroom, legroom, and shoulder room as the 2007, it felt larger. Easy-to-reach storage spaces included center console side pockets, a storage box above the usual glove box, a console box with a large main tray and a smaller accessory tray, an overhead console for sunglasses or garage-door openers, and a rear-seat center armrest with an integral drink holder. The wide, low profile was created to make the Corolla seem sportier. The bottom of the A-pillar was moved forward and the bottom of the C-pillar aft, increasing the angle of the window glass and improving the Corolla’s aerodynamic performance. A standard body kit on S and XRS included a front underbody spoiler, fog lamps, rocker moldings, upper and lower rear spoilers, and engine undercovers. Safety features included front seat-mounted side airbags and two-row side curtain airbags, with active front-seat headrests — in a rear collision, a cable-actuated mechanism moved the headrest upward and forward to limit head movement. Anti-lock braking was standard, while stability and traction control were optional. 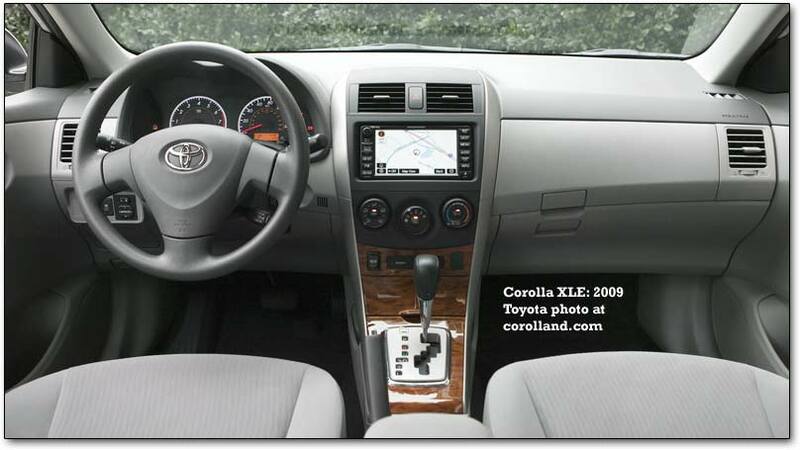 All 2009 Corollas had a rear window defogger, satellite-capable AM/FM/CD audio with four speakers, auxiliary audio input jack, filtered air conditioning, tilt and telescopic steering wheel, 60/40 split folding rear seats, and more. The S had P205/55R16 tires with wheel covers, color-keyed front and rear underbody spoilers, fog lamps, front sport seats, leather-wrapped steering wheel, black headlamp housing, chrome exhaust tip and AM/FM/CD XM® capable audio with six speakers. The XRS added a rear deck spoiler, P215/45 R17 tires with alloy wheels, sport strut tower brace, VSC with TRAC and an off switch, XRS scuff plate, leather-trimmed shift lever and knob, cruise control and an interior chrome accent. Options include an AM/FM/six-disc CD changer with MP3/WMA playback capability, satellite radio (subscription required) and six speakers, a power package that includes power windows and door locks. Other options included JBL Audio, six-disc CD changer with eight speakers, navigation, CD with MP3/WMA playback capability, and satellite radio with traffic, leather-trimmed seats and shift knob, and a tilt and slide moonroof.. The Australians got a version close (if not identical) to the Japanese car in both sedan and hatchback form, but restricted to the 1.8 liter dual VVT-i engine. 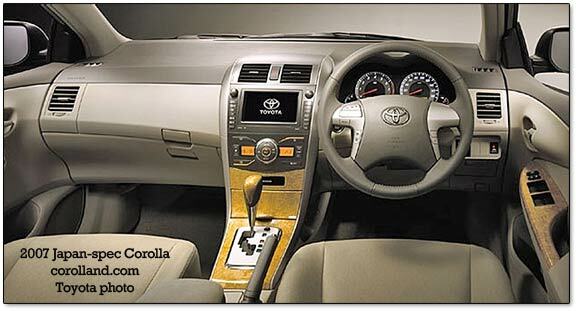 In other parts of the world, the Corolla may be sold as the Auris; or Toyota may take advantage of the “world’s favorite car” status and move it to the Corolla name. A rearview monitor displays an image of the area to the rear of the vehicle while backing up to reduce the burden on the driver when parking (standard on all Corolla Axios). The Corolla Fielder features the world's first one-touch double-folding rear seats with backrests that can be folded flat with a single flip of a lever located in the rear cargo space. The optional advanced Intelligent Parking Assist system supports steering operations when parallel parking and backing into a parking space. Ultrasonic sensors installed on the front of the vehicle detect other parked vehicles and based on the results estimate the physical dimensions of a vacant parking space and set the target parking position. The Corolla Axio features a new Pre-crash Safety System that uses millimeter-wave radar. When the millimeter-wave radar detects a high risk of collision, the Pre-crash Seatbelts provide better initial restraint capabilities for passengers while the Pre-Crash Brake Assist system decelerates the vehicle to reduce the collision speed and contribute to less collision-caused damage. The new Radar Cruise Control system detects and monitors the preceding vehicle and the lane, maintaining a fixed distance according to the preceding vehicle's speed within a preset range of speed. The front corners have been given a curved design to achieve effective maneuverability. The backseat floor hump is minimized to create flat-surfaced legroom, enabling three adults to sit in the rear comfortably (front-wheel-drive models). The steering wheel has a telescoping function that allows its position to be adjusted front to rear for a comfortable driving posture. To enhance visibility, the top surface of the instrument panel is low while the front pillars have been extended forward and made slimmer. The Smart Entry & Start System employs a Smart Key to lock and unlock the doors and a button to start the engine—all one needs is to have the vehicle key on one's person or nearby. The HDD (hard disc drive) navigation system features a 6.5-inch wide display screen and a 30GB high-capacity HDD, as well as a variety of multimedia functions and advanced navigation functions. The new Corolla models feature a new 1.8-liter 2ZR-FE engine and Super CVT-i (Super Continuously Variable Transmission-intelligent) transmission developed as the main powertrain for compact and medium-class vehicles. A newly developed 1.8-liter 2ZR-FE engine adopts Dual VVT-i (Dual Variable Valve Timing-intelligent) that optimizes both intake and exhaust to achieve smooth and powerful acceleration, while offering fuel efficiency and environmental performance at class-leading levels. 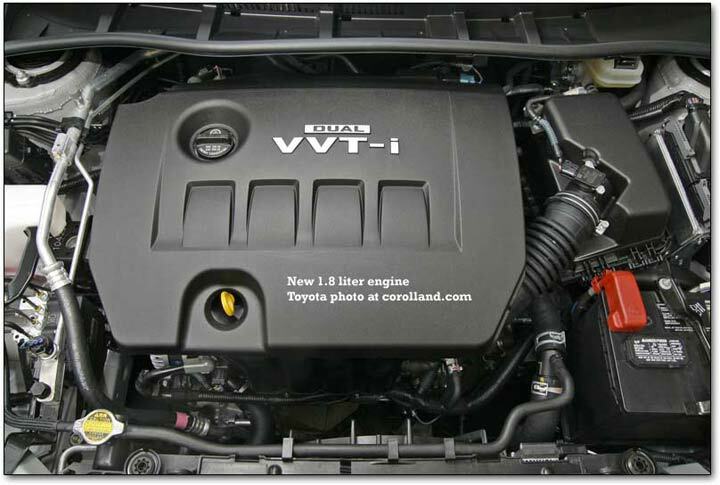 Both the 1.8-liter and 1.5-liter engines are combined with a newly developed Super CVT-i transmission for smooth cruising and linear acceleration without shift shock, as well as for a quiet ride and improved fuel efficiency. The new Corolla has a light-weight, high-rigidity body that seeks both a quiet cabin and superior aerodynamic properties; it uses an advanced chassis to achieve performance that makes it truly possible to experience the joy of driving. Key components of the front and rear suspensions have been tuned to provide brisk maneuvering and cruising stability, as well as a comfortable ride. 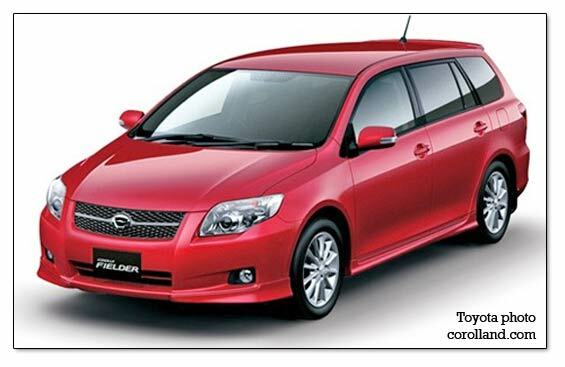 * Figures for Corolla Axio (front-wheel-drive model with Super CVT-i) under the 10-15 Japanese test cycle. During collision tests under stricter-than-normal standards, the speed was set at 55km/h, and the vehicle was subjected to omni-directional, vehicle-to-vehicle collision tests with a vehicle up to the 2-ton range. Through the use of a body structure that effectively absorbs collision impact, Toyota satisfied all independent targets for survival space and dummy injury. The pedestrian-injury-lessening body structure has been evolved to further reduce pedestrian head injuries, pursuing a class-top level of protection. All vehicles in the two series have been certified as having emissions levels 75% lower than the 2005 standards under the Japanese system. The 1.5-liter front-wheel-drive model (with CVT) and 1.8-liter four-wheel-drive model of the Corolla Axio, and the 1.5-liter front-wheel-drive model (with CVT), 1.5-liter four-wheel-drive model, and 1.8-liter four-wheel-drive model of the Corolla Fielder also achieve fuel efficiency that is 10 percent greater than the Japanese 2010 fuel efficiency standards, qualifying for incentives under the Japanese government's Green Taxation System. Eco-VAS (Eco-Vehicle Assessment System)—Toyota's original comprehensive environmental impact assessment system—was implemented to achieve, as efficiently as possible, the overall reduction of environmental impact, from initial development to disposal, throughout the vehicle's entire lifecycle. LCA (Life-cycle Assessment) was also carried out, aiming to reduce CO2 and other atmospheric pollutants, not just during the use stage, but also during the vehicle's entire lifecycle, from manufacture through to disposal. A review of the materials, processing methods and adhesives used for interior parts resulted in a reduction in the amount of VOCs (volatile organic compounds) used, thereby also reducing the discomforting odors emitted from such compounds. An Eco Drive Indicator lights up when the vehicle is being efficiently operated to raise the driver's awareness of environmentally considerate driving and contribute to higher fuel efficiency. Welcab Rotating and Sliding Passenger Seat models (Type A and Type B) have wider door-opening angles than the base models to further facilitate vehicle boarding and exiting. Welcab Friendmatic Seat models (Type I, Type II) allow for the installation of a specialized driver's seat and devices that facilitate driving, enabling people without use of their legs to drive with only their hands.